Every building is a real-time solar collector, gathering light and heat. Its primary collecting surface is its roof. But unfortunately we don't put that hot rooftop energy to good use. Even in this time of increased awareness about greenhouse gases and energy conservation, most of that rooftop energy goes to waste rather than being harnessed to make hot water or electricity. Futura Solar LLC offers an efficient low cost way to put that rooftop energy to work - via a patented application that combines existing technologies into a structurally integrated solar roofing system. The most cost effective way to gather this rooftop energy is to do it right the first time - when a building is built from the ground up. Yet many buildings are also undergoing modifications such as repair, retrofit or redesign. This means there are perfect opportunities to bring efficient, cost-effective solutions to problems of expensive heating and cooling or electric energy by rethinking rooftop energy capture and utilization. Futura Solar's Sawtooth Solar Daylighter (an A-frame system), can be applied to buildings large and small, from shopping malls to schools and 'big box' type buildings. The sawtooth array pictured above becomes the roof, and the roof becomes the array. The tri-truss design replaces a portion of the main building supports (two expanded joists). 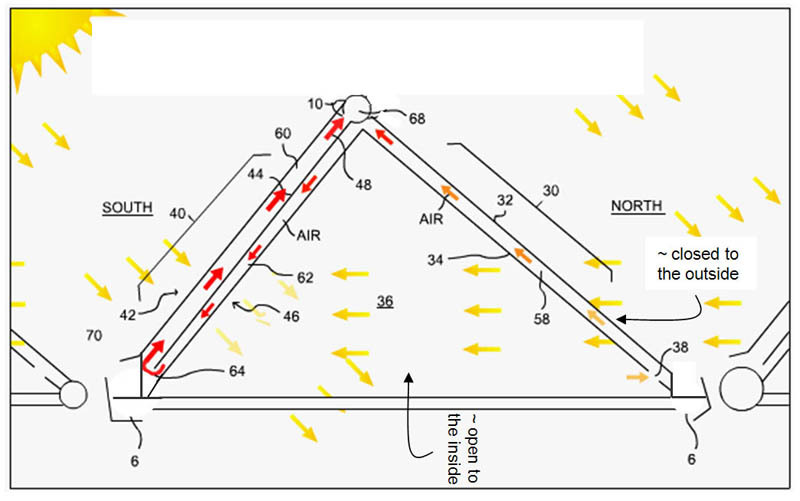 It is then combined with an Air Heater (southside) and Ventilator Window (northside) built onto the tri-truss, making for ultra-efficient capture of both incident and reflected solar light. Is solar power in your building energy budget? This is an important question since it's otherwise a waste of money not to harvest all the free energy falling upon commercial, industrial or government building roofs. In fact, conventional roofing runs up a building's electric bill every effort to substitute solar energy for fossil fuels represents an investment that is certain to pay off in very short order. The Futura Solar sawtooth A-frame design allows bright diffused daylight to offset the costs of electric lighting, immediately reducing a building's energy cost burden. In addition, both solar water heating (SWH) and photovoltaic (PV) electricity can be achieved, meaning additional building cost reductions by simply allowing the sun to do what it does best. Excess PV can even put the building in the power business if net metering is allowed in your area. By virtue of the multiple benefits delivered, this integrated solar roofing system operates as a productive asset for any large surface area rooftop. Conventional roofing has an amortization period - it rapidly depreciates, becoming less valuable over time. Instead, the Futura Solar rooftop creates value by dramatically reducing the cost of building operations, and even offsetting that cost burden by returning energy to the grid under net metering. Such a system not only reduces building operating costs, but enhances a building's appraised or resale value by offering sustainable, renewable energy features designed for 21st century needs. Bright diffuse daylight, thermal and electric energy, process air, GHG reductions, emergency energy backup (via PV storage) - these benefits illustrate the remarkable value of this patented design.